When you see David Kazoora, it is easier to imagine he has always had it easy and smooth taking girls back to his place. This is probably why there was a murmur of mixed reactions among MUBS students when Kazoora, a media personality and events MC boldly revealed that he never slept with any girl because he didn’t have a room. His roommate on the other hand would have him out as entertained. Kazoora revealed this last Friday while he was speaking at the 10th annual MUBS hospitality day as one of the celebrities invited to inspire the business students. After cracking up the students with this revelation, the Buddies boss went on to share a touching story of how he took a loan from his sister to start a chicken business which enabled him pay tuition for the Nakawa based campus. “My sister gave me a loan of four hundred thousand, so I started a chicken business at home and the profit I got, the Shs700,000 is what I used to pay my admission, it was Shs300,000 and then my tuition, the total was Shs700,000. So my first semester, it was my own money, from my chicken business and I rolled here at MUBS.” Kazoora said. Kazooora also tipped the students that he is currently in talks with the MUBS administration to share his expertise that will foresee the training of the finest media personalities in the country. This budding entertainment personality who started off his TV career as a presenter at former WBS TV’s entertainment show, Jam Agenda has risen to become a TV production and manager of Magic HD – a sister TV of UBC. 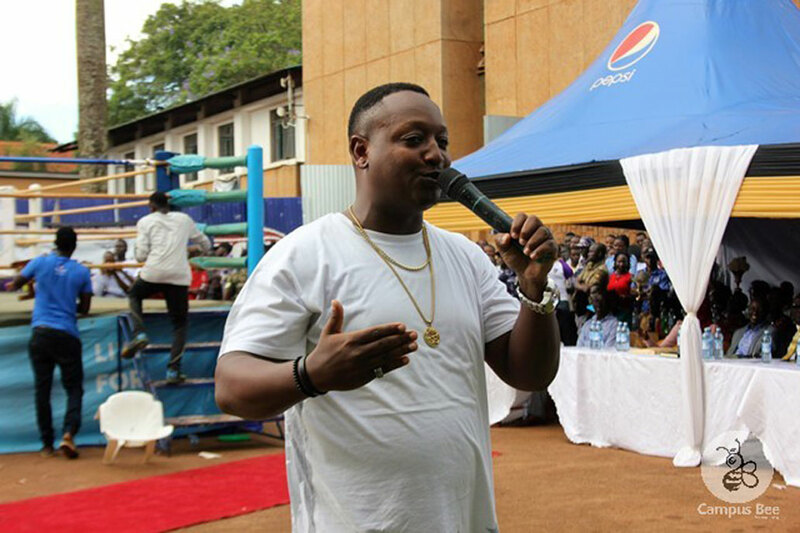 Other celebrities who graced the event to inspire the students were celebrated singers Jose Chameleon and Bebe Cool.